This creature is a blackened, bat-winged fiend's head. That's right just a head. Oh yes, tentacles dangle from chin and scalp as well, and its fanged mouth hangs agape. Watch out for its dreadful shriek attack! 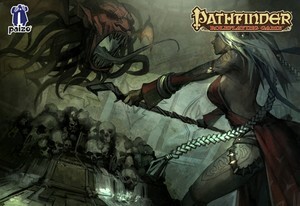 This is a breakout SoundSet from the Pathfinder Adventure Path SoundPacks. If you are a subscriber you will automatically gain ownership of this SoundSet. The music in this SoundSet was composed, performed, recorded, mixed, and mastered by Benjamin Loomes for Paizo Inc. Flying Fiend Battle SoundSet © 2014 Paizo Inc. Paizo Inc., the Paizo golem logo, Pathfinder, and Pathfinder Adventure Path are trademarks of Paizo Inc. Sounds created under license with Paizo Inc.